Los Angeles Times Book Prize nominee Ariel S. Winter explores the secret legacy of an enigmatic family in this thrillingly atmospheric novel with a compelling and unexpected twist. He becomes increasingly fascinated with the family whose lives are entwined with the home -- angry and rebellious Clark; flamboyant Kent; fragile, beautiful Mary; and most of all, Beachstone, the mysterious man whose history may hold all the answers Sapien has been searching for. As Sapien unlocks their secret loves and betrayals, the dangerous past of Barren Cove will indelibly change him...and who he is fated to become. 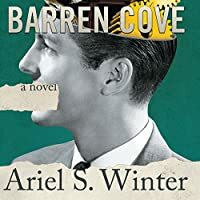 A brilliantly imaginative and poignant tale in the tradition of Kazuo Ishiguro and Neil Gaiman, Barren Cove is a luminous and surprising exploration of legacy, loss, and humanity itself.